A precision platformer tasking the player with running, jumping, and punching through hazardous levels to reach a goal. Each one features a risky optional collectible and also grades you based on your fastest run. Taking any damage from an obstacle or an enemy results in immediate death and level restart, but the levels are small and short. The game is challenging with little margin for error but the minimal punishment makes the required practice less frustrating. Philosophically and structurally, it’s very similar to Super Meat Boy , so comparisons are inevitable. It’s less polished, but that’s a really high bar. 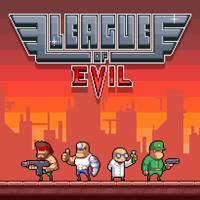 If you like bite-sized precision platforming, League of Evil delivers. I Stopped Playing When: Unfortunately for me, League of Evil also inherits Super Meat Boy ’s lack of checkpoints and habit of featuring multiple different kinds of challenge in the same level. This means the same pattern where I end up spending most of my time replaying early parts of a level just to get another chance to practice the later part, which I find more frustrating than satisfying. As a result I put the game down when the levels got longer.